I was in New York last week. You can definitely feel the recession’s pinch on Manhattan’s food scene. But as usual, restaurateurs are rising above the challenge. Their latest invention: the perfect recession-era wine list, featuring a wealth of carefully chosen value wines from around the world. The key words here are carefully chosen. It’s one thing to put a wine on the list to hit price points at or below $10/glass and $40 a bottle. It’s another thing altogether to find really tasty wines in this range. Enter Yerba Buena. This Lower East Side hotspot boasts a Zagat food score of 24, and features Spanish/Latin plays on suckling pig, black cod, and the like. Appetizers averaging $15 and entrees at $26. With this kind of menu, I expected the value wines would start at $40, and get interesting at $55 (best quality-to-price ratio). My next stop was The Meatball Shop, my favorite bargain lunch stop I’ve found in a long while. Not only did I get 3 kinds of perfect meatballs served “slider style,” but I also noticed the wine list on the chalkboard. I had too much work to do to taste all these wines at lunchtime, but I can at least vouch for the selection and pricing. Have a look yourself (see image) — many glasses of Italian table wine for $5-7/glass or $24/bottle. The few names I did recognize have very favorable quality-to-price ratios. 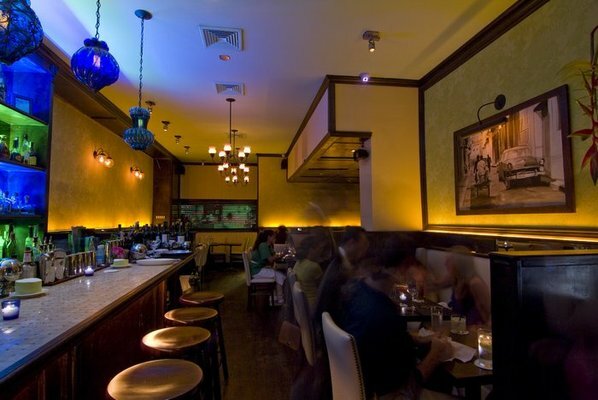 Finally, we visited the 8th Street Wine Bar in the West Village, one of Wine Spectator’s top New York wine bars of 2008. The wine list had 15+ wines under $40, mostly from Italy and France. My first reaction was wow…we’re not in 2006 anymore, when any value-priced bottle would have been priced $5 higher, and the 8th Street list would have been chock full of “Big Napa,” Burgundy, and Champagne for all those bankers who still had jobs at the mortgage-backed securities trading desks. Today, those wines are still on the list, but have noticeably less presence. So what did we choose? A Rosso di Montalcino and a negromaro, both under $40, and both excellent…enough that we ordered a total of 6 bottles for our party. Walking out of 8th Street Wine Cellar, I realized that, recession aside, there really hasn’t been a better time to find value wines in restaurants than right now. Especially if you’re into international wines, and especially if the wine director knows how to sniff out the best values on the market. Wine medal competition study reveals…randomness! Should you spend $20 on a single wine glass?